Transgender rights and visibility is the theme of this year’s Tel Aviv Pride Celebration. In a 40 Years of Pride panel, leading transgender activists from around the world discussed some of the most pressing issues facing the community. On the cutting edge of the fight for equality is the movement for transgender and gender non conforming rights. 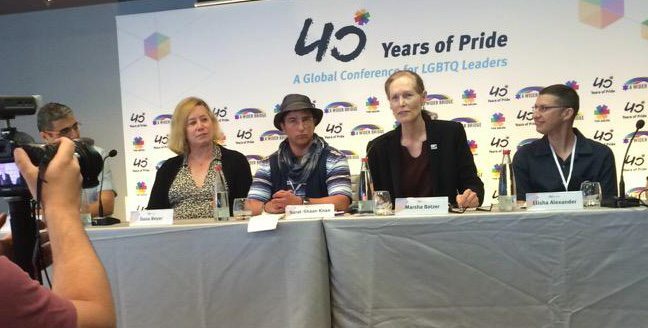 Marsha Botzer from Seattle’s Ingersoll Gender Center, Dana Beyer from Gender Equality Maryland, Liberal Judaism’s Surat Shaan Knan and Elisha Alexander from Maavarim took part in a Trans Visibility and Empowerment panel during 40 Years of Pride conference. Together our conference addressed the uncomfortable truth that transphobia persists not just in the straight world, but in our own LGBTQI community as well. Despite our shared experience of suffering and discrimination too many still lack an understanding of the struggles of our transgender and gender non conforming family.